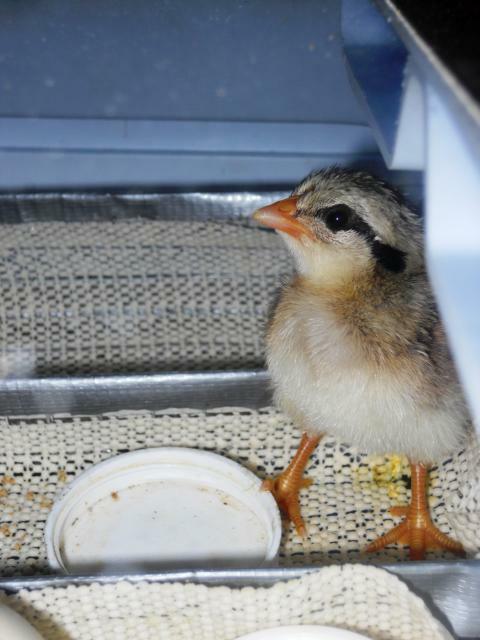 We wanted to get the full experience of raising chickens so hatching eggs to perpetuate the flock seemed like a fun project. I wanted to see if I could come up with a working 'bator without spending any money. I was victorious in my pursuit. The hardest thing to scrounge was the t-stat. I probably spent more time than it was worth getting it as they cost about $8. 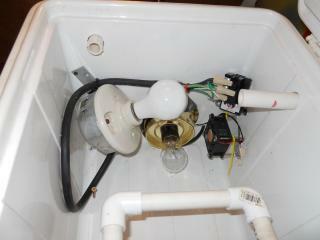 I then wired the big white light bulb(25w) to burn all the time. 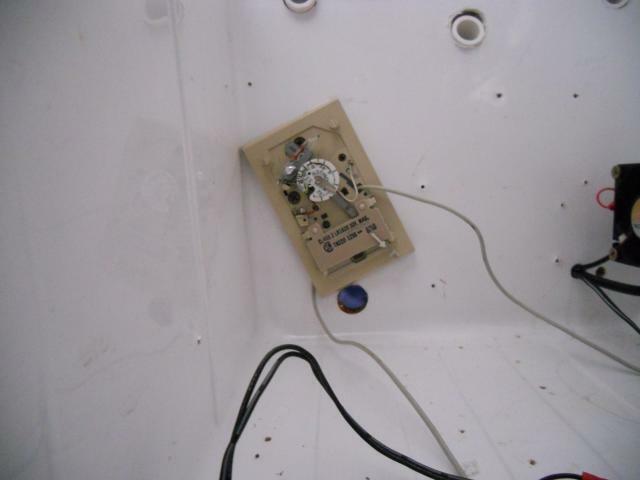 With 3 vent holes open it maintains 98-99F The 40w bulb in the gold fixture is wired through the t-stat. If the 40w bulb goes out I won't loose a rack of eggs. The constant switching on and off is hard on light bulbs so this method seems to have a fail-safe. If the 25w bulb goes out the t-stat light will still maintain the temp. 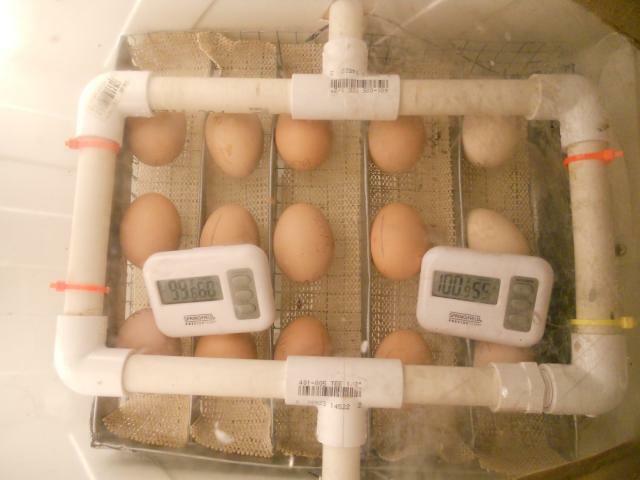 I built the egg rack with pvc pipe and fittings. It is carefully sized to fit an 18 egg carton. The wires are to insure that a full carton of eggs doesn't fall through. It pivots on the pipes sticking out of the cooler for turning. The kidney shaped dish with the sponge is for humidity and works well. I am at 55% now and I will add another dish when it is time for lockdown. 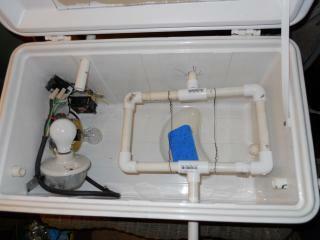 I want to add a tube through one of the vent holes to refill the dish. I put eggs in yesterday (4/12) and the temp been staying right at 99.5. 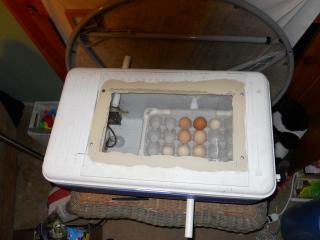 I have 2 electronic thermometer/hygrometers in the egg tray that I can read through the window. One hour old Silver Phoenix. 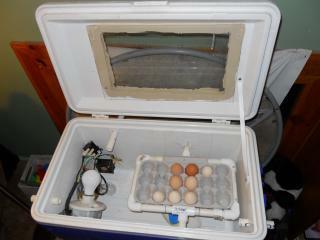 We fired up the cooler again this week to receive eggs. A major design flaw has been corrected. I was unsatisfied with the performance of the thermostat. I wasn't having very good luck with the hot water heater thermostats and I tried several of the same model. Not all of them would work well same model and all. 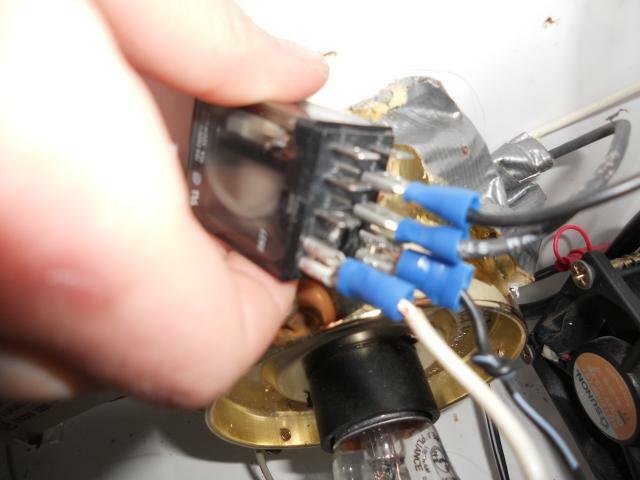 I had some mercury bulb thermostats laying around but the temprature range seemed to be a problem. Mercury thermostats also only hold 30 V max so line voltage is not an option. The solution to both problems is cheap. I used a 12 v wall transformer, switched by my thermostat to power a relay. My light is then wired through the relay switch. To correct the temp range of the thermostat just tilt it about 15 or 20 degrees counterclockwise of plumb. Don't put the cover back on as it will impede movement of the tstat bulb. The relay cost 10$ at raido shack. I would bet this is as accurate as a wafer for little cost. 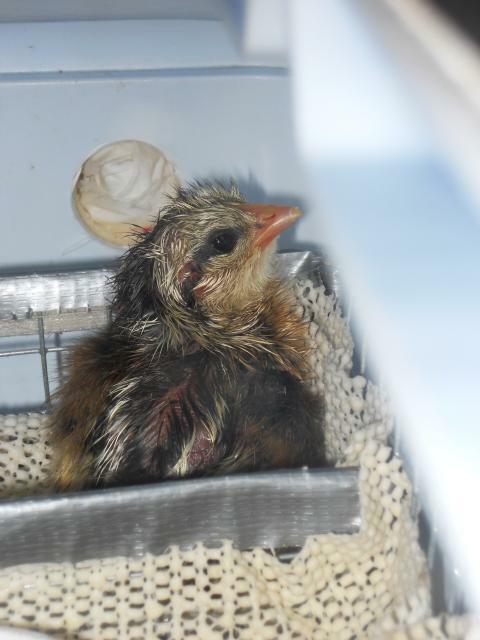 I filled the 'bator today, 2/25/11 with 3 lav orpington and 12 BBSO. Looks like a great setup. The idea of a backup bulb is a really good idea. Spacers cut from a pen is pretty smart too. Reasonable description on build of the incubator. A few more pics would have been helpful. Overall not a bad article. If one has to buy a relay and a mercury thermostat seems it would be just as cheap if not cheaper to get the wafer thermostat? What has been your hatch ratio? Do you think there would be any way to add an automatic turner to it? What kind of thermostat was used? How did you build it???? how exactly is the new basket built ? how do tell if the brown eggs are fertile or not.